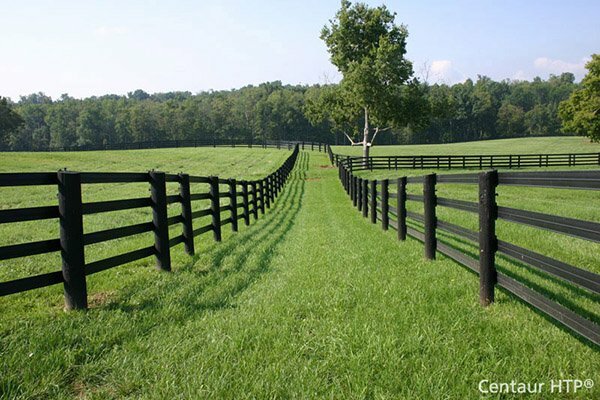 Centaur PolyPlus, Roll | Hoover Fence Co.
PolyPlus® HTP® is an attractive and inexpensive choice for agricultural and perimeter fencing. PolyPlus® HTP® features a high tensile 12.5 gauge galvanized wire embedded in a tough, flexible HTP® Polymer coating. The smooth safety-finished outside diameter is 5/16". PolyPlus® HTP® fence wire is designed with an impressive minimum break strength of 1,350 lbs. per wire and features the ability to flex back into place after impact reducing the chances of injury to animals and damage to fence. PolyPlus® HTP® is strung in high-tensile fashion on your own fence posts, but offers huge advantages over traditional high tensile. Beyond the significant increase in your horses' safety, the HTP® covering means it won't rust, stretch or fade. PolyPlus® HTP® carries a 20 year limited warranty. PolyPlus® HTP® is available in white, black, and brown. PolyPlus® HTP® is sold in 1,320' rolls only. You may mix and match rails, i.e. PolyPlus® HTP® wire for top only or for all wires. Installation is easy enough, most customers choose to install it themselves. Rails are installed continuously around fence area with barbed staples and tightened using tensioners. Simple installation makes this one of the easiest fence system to install. All components are sold separately. Not all components and optional accessories are shown below, please read installation manual to see which items will be needed for your particular installation.